Forgiveness in action is demonstrated most strikingly in the lives of various great persons, and sometimes it has been effective for the perpetrator and also for the forgiver. But that is far from being the rule. The ability to forgive the wrong-doings of others is a respected and praised quality, and the Christian doctrine of unconditional forgiveness is widely respected in word, though far less so in action. What causes this discrepancy? The obvious answer is that it is a remarkably naive and impractical to forgive (as well as forget) crimes and outrages when the perpetrator will neither apologise not change behaviour and desist from the offences. Simply showing remorse through recognition and admission of culpability is not much to ask, not unless positively changed behaviour on the behalf of the offender is also required. Forgiving someone for an evil act - whether against oneself or, what is always easier, against another - unfortunately but obviously does not guarantee an improvement in those forgiven. It is not itself efficient as a preventative to further crime. Those who ask for pardon from the consequences of their crimes (such as punishment by society) can hardly be granted it fairly if they do not ask for pardon in the sense of admitting and regretting what they did, and showing - where relevant - willingness to make up for that they did to the injured party. The idea that good actions should deserve rewards - and bad ones punishments - is very deep-rooted in us. So much so that religions have held for millennia that divine justice operates on everyone, in one way or another. This, of course, is a matter of belief or speculation, not a testable theory, for no divine agency can be located or investigated. Besides, there are countless examples of people who commit many and great crimes who live out their lives quite comfortably and do not suffer anything that could be considered 'punishment that fits the crimes'. The Eastern religious variant of this is the doctrine of karma, which holds that everyone (who is not at least a saint or the like) is reincarnated in a different body at some time after death. Crimes that go unpunished in this life will, it is believed, be punished in a future lifetime in fitting measure… provided that the person involved does not go through a major sea change - self-sacrificing good on a sufficient scale - and so receives divine absolution. This would say that a criminal must eventually suffer the consequence of his crimes, but not necessarily in this life. 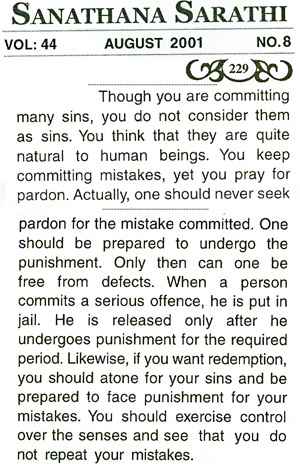 Pardoning such a person, in Eastern religious eyes would not remove the karma, the inevitability that the punishment would ensue automatically in this life or the next… ordained by God (that is, by his law of karma). The basic Christian view is that it is God's prerogative to forgive sins, not man's… which would make for much confusion if the law were intended strictly to follow Jesus' doctrine! The determinist religious view on karma holds that, only an all-powerful God can forgive sins and remove or alleviate the otherwise inevitable reactions called ‘karmic’. Yet another paradigm of how karma works holds that divinity is (also) within us - at least to some degree - so that we create our own karma for good or ill. Forgiving others would bring good returns, not doing so would bring the contrary. However, that undermines the main tenet of the karma dogma, for then it is ourselves and not any universal agency or divine law that rewards or punishes and we alone create our personal destiny and our choices decide what is 'wiped off the slate'. Does forgiveness mean that one should stand by and watch wrong-doing without intervention? Or worse, to appease the wrongdoer afterwards. Done in the right spirit, to stop wrongdoers is actually to help them to too… to hinder worse things and so protect them from themselves (or for those who are deluded, so they avoid accumulating further bad karma). Thus, the criminal cannot be encouraged to continue, and then neither is hate continually incited in oneself, which is a prerequisite of any genuine forgiveness. It is an observable fact of life that forgiveness is extremely difficult - or even proves impossible - without renewal of one's trust, which often requires at least some change in the behaviour of the wrongdoer. Despite this, however, apparently superhuman acts of forgiveness can be seen even in today's world even by victims of utterly terrible tortures and sufferings, and even where unrepentant perpetrators are still at large. The rewards and punishments in either case will doubtless be equally potent. It happens that forgiving someone repeatedly only leads to getting struck again all the harder. Every schoolchild who gives in to a confirmed bully knows that much. The same applies in the case of confirmed long-term criminals, whether civil or military. Some legitimate defence against this must be made possible, (unless one is so out-of-touch with worldly life that one prefers to wait for divine justice or karmic retribution). 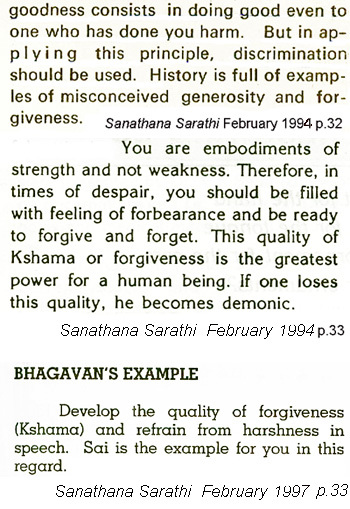 The 'defence' that will normally be effective is to act sensibly but determinedly to stop one's opponents further aggression or wrong-doing, while forgiving mentally and from the heart as far as one is capable or sees fitting. An Indian parable to promote non-violence tells of the cobra who was taught never to bite anyone or to kill any animal, yet which suffered terrible stoning from village boys as a result. The cobra's guru came by to find the cobra crushed and dying. The guru's final comment was "I said don't bite, but I didn't say not to hiss!" Both repentance and retribution can justly be required of wrongdoers. Forgiveness is certainly not a question of giving someone license to commit any wrong they wish for as long as they please. But the Christian call for unconditional forgiveness is an appeal to this being 'an ideal world'. As to forgetting and forgiving, it is not always so easy in our actual lives. As Clement Freud famously said: "I forget but never forgive' because there's a whole lot of people on the other side of the House of Commons whom I hate, but I can't remember why." Some religions hold that this divinity is also within us, in some part, at least, if only yet in a potential form. So forgiving requires finding and expressing this potential. But that undermines the whole idea of karma completely, for then it is us and not any universal law which decides what is to be forgiven and have ones own wrong-doings wiped off the slate. The world has a rich enough supply of do-gooders, proselytisers who proclaim that one must simply and immediately forgive and forget every wrong done against us. But the problem in reality lies in our finding the resources to forgive within oneself. However well-intentioned preachers of forgiveness may be, their dictum ignores inescapable facts of life, and further overlooks the ways in which it is in their belief all regulated by God's law. Without considering such measures as reaching mutual understanding and agreements on when and how forgiveness can benefit everyone, success in forgiving and forgetting will surely be quite limited. The two much-quoted Biblical dicta clash: "An eye for an eye and a tooth for a tooth" is confronted by Jesus' advice to "turn the other cheek" when struck, and to do so repeatedly. These black-or-white alternatives are simplistic, without the nuances required by the many forms conflicts take and also the variety of possibilities of their solution that may be found.